Today I'm going to share with you a card I had great fun making and one that can be done in stages whenever you have some time to spare, I used the Imagination Crafts Snowman Art Stamp, it's a very cute image. 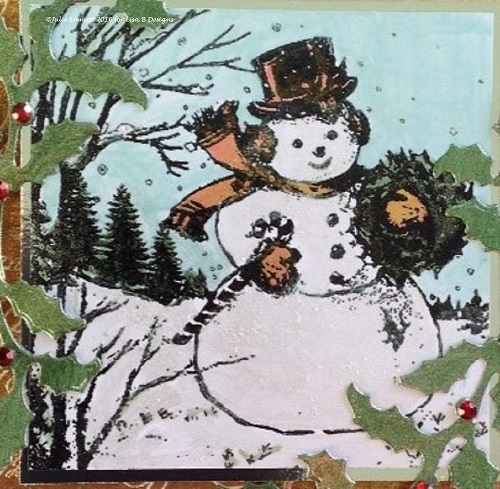 Firstly, I stamped the Snowman Art Stamp with Onyx Black Versafine ink on to Super Smooth card and heat embossed with WOW! Clear Gloss embossing powder. I then chose my Starlights colours: Pearl, Mint, Zinober Gold and Green to paint in my stamped image. I dispensed a small amount of paint on to my tile, mixed with a little water and started painting - I mixed the Pearl with a bit of Diamond Sparkle Medium for good measure to add to the sparkle! 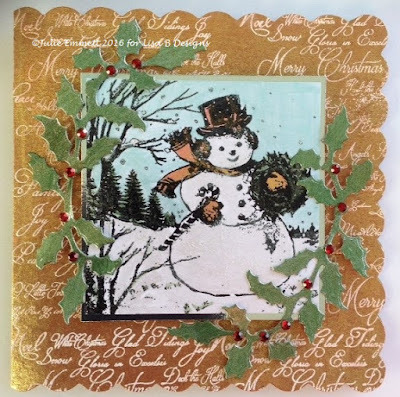 Christmas Words Art stamp on a kraft card blank, with Versamark ink and WOW! Bright White embossing powder, which I heat set. Repeat stamping until I covered the card. Then the fun bit.... I mixed a bit more Zinober Gold Starlights with some water and used a wide brush to paint over (wiping the embossed text slightly with a paper towel). I was really impressed with the background as it's got the really good shimmer of a posh Christmas card! I die cut some holly from some scraps of super smooth and painted these in the same way with Green Starlights and while this was drying I square cut my snowman and matted this onto a piece of silver Mirri card. With all the components made for my card I put them all together. Mounting the matted snowman on double sided sticky pads and using Cosmic Shimmer to glue on the holly, with the finishing touch of a few red gems to pick out the holly berries. I was pleased with this card and the shimmer the Starlights gave it, which I think make it extra special but very easy to achieve. I'm really getting into Christmas cards now the weather is a little chillier! Well, that's me for today, hope you have a good day and see you next week. Fab card Julie, I like the script stamping behhind the image.